We get a lot of so-called "Michigan fans" on this site. We'll see about that. Q. 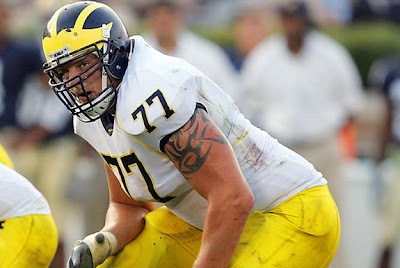 As has been oft-repeated, Jake Long was called for 2 penalties and allowed 2 sacks during his Michigan career. Name the year and opponent for each miscue. The first person to guess correctly gets a free Michigan Cato June jersey and a $10 gift certificate to his favorite place in Ann Arbor - Cava Java! Editor's Note: Two down, two to go. And no, we're not going to tell you which two are right. Is this the best you've got? The false start was this past year against Northwestern. The holding penalty was his Redshirt Freshman year against Notre Dame. The two sacks: One was this year against Ohio State (Gholston) the other was his Redshirt Freshman year against Michigan State (Kevin Vickerson maybe?). One as a right tackle, one as a left tackle.